Was America really created based on the ideas of a few founding fathers? No. It wasn’t. We easily forget that the European settlers of America lived amongst Native Americans for over a century before they ever considered founding an independent nation. In truth, the experiment of the United States began in large part because the colonists observed living examples of liberty and justice in Native peoples right here on this continent – in total contradiction to the monarchies that prevailed in Europe at the time. Many of the human rights concepts – as well as many of the principles in our founding documents and the checks and balances in governing came directly from Native America, and particularly from the Iroquois Confederacy. The idea for the colonies to come together at all came from Chief Canassatego (Onondaga) to Ben Franklin, who convinced the other founding fathers. This was the sacred basis embedded in our founding philosophy. It is also evident that, at its inception, the United States was a half-baked idea – in part because our founding fathers chose to incorporate only certain parts of Native philosophy into the new political nation. Women’s councils held an important function in Native America, but women were totally excluded from US politics at the outset. Blacks and other minorities were also initially excluded, and it taken centuries to get close to full participation. 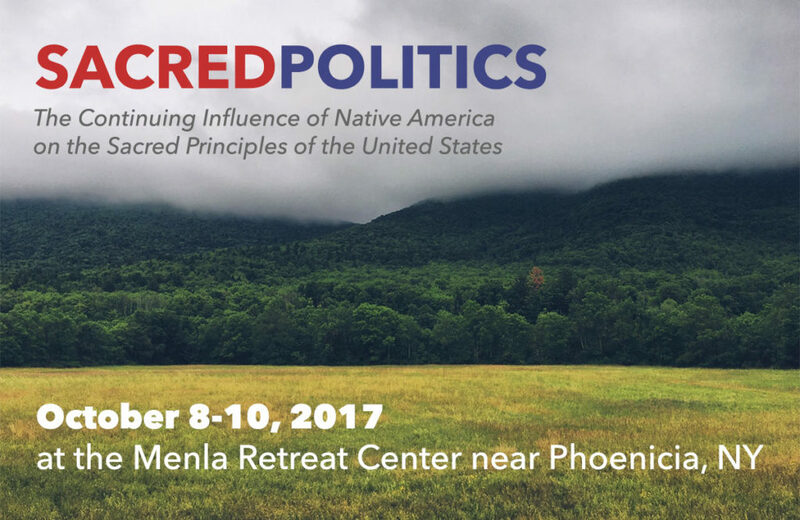 While things have improved over time, our purpose in this retreat is to finish the process – and thereby create our own model of a more perfect union by including and embodying the entire beauty of the sacred founding principles of America. We may only be a small group of committed citizens, but never doubt that we can change the world. As Margaret Mead said, it is the only thing that ever has. Now is the time to act as many of the sacred founding principles are beginning to be eroded. When things are falling apart, this is the best time to rebuild at a higher level of integration. We invite you to join us as we gather on the sacred land of our Iroquois ancestors to address these principles through ceremony; deep dialogue; dream, visioning, and time in Nature. We embrace both the spiritual and the material; intuitive and rational; feminine and masculine ways of knowing. We profoundly revision both our nation and ourselves. We learn from each other and directly from the spirit of the land. We do so with the intent of creating a more perfect whole for both our own self, our community, and our nation. We put the full force of our collective spirit toward this prayer coming true because it must. Susan Kaiulani Stanton (Mohawk/Native Hawaiian) is the founder of Grandmothers Circle the Earth Foundation, an international organization that travels the world in service of Mother Earth and future generations, giving birth to new grandmother councils all over the planet. Susan has been a delegate to the United Nations Commission on the Status of Women, and has also participated in United Nations forums on Indigenous rights. She is currently the Director of the River Sidon Peace with Justice Project, working to protect, preserve, and perpetuate Mississippi watersheds.